Mother’s Day Outfits: Mother’s Day is a special occasion for all mothers across the globe. This is one day they are allowed to take a day off from their mommy duties and are celebrated like they deserve to be. To make this occasion extra special, plan a fun family and friends hang out to fill the day with laughter and celebrations. Throw a party or plan a quiet Sunday Brunch to show support to all the fellow mothers out there. We would recommend you to start planning your outfit for this year’s Mother’s Day to look your best. For a casual and laid-back style, opt for a pair of mom jeans and style it with a cool t-shirt. For a more edgy and cool look, you could opt for a fun midi or long dress. However, we get the most fun watching mommies twin with their little ones in matching outfits. You could go for a simple outfit or even a themed one, anything that could help you bond on this special occasion. Read on to find out about all the right hair, makeup and outfit ideas that you could choose for Mother’s Day this year. What To Wear This Mother’s Day 2019? For an intimate mother’s day brunch, go for something that is light, presentable and casual. You can go for a simple blouse to wear over a pair of denim jeans. If you are throwing a party for fellow Mommies, consider a theme to make it more fun. Dress your little one in matching outfits to make everyone go “Aww”. Add in cool accessories like funky bags, cute belts, eyewear and some simple pieces of jewels. Got something formal planned? Choose from an endless variety of dresses to look elegant and chic. You can style the dresses with some cardigans or blazers if you wish. With kids keeping their mommies on their toes, we would recommend footwear that is comfortable yet classy. Espadrilles and Summer sandals are a great choice for the occasion. Side plaits are always a winner especially for important days like these as they are quick and simple yet sophisticated and stylish. If you are feeling like a bit more of a formal image then why not choose a perfectly groomed bun? Once again easy to do and creates a stunning look to any outfit. For a completely comfortable and carefree look, leave hair brushed and free-flowing. For more ideas on great and simple hairstyles for Mother’s Day why not check out our article on Cute and Easy Updo Hairstyles. For mothers’ day make-up keep colors neutral. Too much color can overkill a simple outfit. Skin tones bring out features beautifully without being overpowering. If you want to go for colors then subtle pinks or blues are a good choice. Steer away from bright, bold colors including neon, these colors look too overbearing and will instantly ruin your Mother’s Day image. For this Mother’s day if you are confused about what gift you should give to your mom? check out this list of Top Gifts For Mother’s Day. Maxi dresses are a fantastic garment for Mother’s Day. There is never a problem finding one to suit your look and figure as they are found in different styles, shapes, colors, and prints. They are great for a casual yet fashionable look. Why not add some shape and depth to your outfit by wearing a long cardigan in a contrasting color? via. 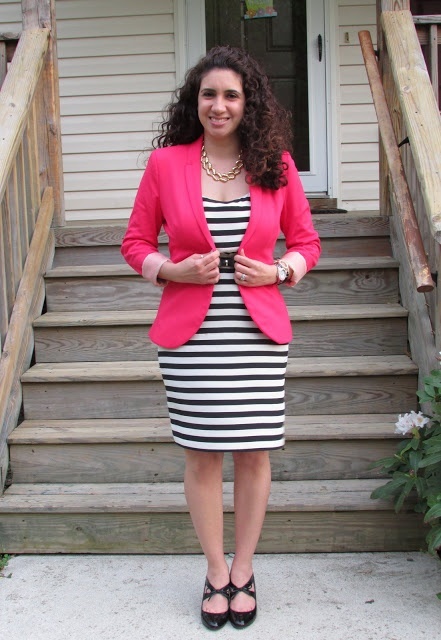 Another great outfit idea guaranteed to get you noticed on Mother’s Day is a stunning flare and blazer combo. Flared jeans add shape to the bottom of an outfit and a blazer will give you shape definition around the waist and shoulders. If you are feeling brave and the weather is nice why not go for a cheeky blouse and shorts get up? Stylish and suave in neutral colors this naughty little outfit is definitely going to give mothers everywhere that eye-catching look on that special day. Be careful not to venture towards teen looks as this can sometimes be balancing on the brink of ‘mutton dressed as lamb’ which is a look no woman wants to create! T-bar wedge sandals are a great footwear idea for Mother’s Day. They are extremely versatile and make for a fantastic addition to any jeans and top combination or even short and maxi dresses. For a more practical shoe why not try a pair of black or brown ankle boots? Leather and suede are both great fabrics which will match with pretty much any outfit and are also perfect going out shoes. However, if you want to go a more comfortable way, some trendy flats will definitely look great. Taking your family out for a Sunday brunch? Dressing up early morning feels tedious and it seems impossible to make the effort to look presentable. Here is how you can look and feel comfortable and effortless in a simple outfit like this one. Since Mother’s Day falls around Summer, these tropical print pants seem like the best choice. With printed pants, it is recommended to add a top that neutralizes the look. This grey sweatshirt is what our Sunday dreams are made of! Throw your hair in a bun, carry a tote and you are good to go! For more ideas, have a look at our special post on Sunday Brunch Outfits. Here is another great choice for mothers and daughters alike. For a quiet and intimate time together, why not take a stroll out to the park to catch some time to chat away? For this cute day out we recommend this sporty attire featuring a cotton skirt with a basic grey shirt. We love the comfortable flipflops and the side braid that gives it a very neat and crisp look. We have seen a drastic change in the fashion industry after the body positivity movement. Fashion for curvy women now seems so much easier than it was before. Depending on how you choose to celebrate this fun day, choose outfits that are not just flattering but also look super trendy. This Polka Dot mid-length dress seems like a great option for a fun party. The red necklace and heels are adding a pop of color to this super glamorous look. Here is an alternative if you wish to go simple this Mother’s Day. This ethnic tunic looks absolutely stunning with these wide pants. Summer sandals are a great footwear choice to go with pants like these. Mother’s day is the day to celebrate moms and to be celebrated by children. For this special and intimate occasion, what better than a gorgeous dress? It could also be a great Mother’s day gift to give to your Ma. Here are two ways to style a basic dress. You could style a long dress with a cardigan or blazer. Or, you could wear a short dress over a pair of leggings or stockings. This outfit can also be worn by daughters for a youthful and chic look. Polish this look with a cute handbag or a pair of pearl danglers. ↓ 16. Denim Jacket with Maxi Dress. A perfect outfit for women over 40. While most people believe this is the age where you need to dress down, we simply do not agree! Channel out your inner fashionista by going for classy and trendy fashion options. Age is just a number and it can never define your fashion choices. Here is how to look presentable and absolutely classy at forty. Black is a classic favorite that goes well for any occasion and can be styled in endless ways. This geometric-patterned long dress seems like a great Summer option that you could wear to a Mother’s Day Lunch or Party. Wear it as is or throw in a Denim jacket for an edgier style. Wear this awesome combination with a pair of Summer sandals and a pair of silver hoops to get the look right. Have a look at the following images and see how the celebs are rocking Mother’s Day. The famous Vampire Diaries actress is known for her beautiful looks and killer style. Here is her stunning look that you could recreate for an ultimate Summer style. We absolutely adore this look dress that she wore with a cardigan. The belt helps keep her dress in place, defining her waist. Warm Summer weather calls for breezy outfits that can help you stay cool and super glamorous. The white flip-flops and the black bag add in an element of style to her super comfortable and casual style. If you’re planning a special movie night with your mother for mother’s day, here are 30 Chic And Comfy Outfits For Family Movie Night In 2019. The almost 50-years-old actress, Jlo, is known to be one of the most beautiful celebrities of all times. She is a mother to a pair of twins and is a doting mom to them. Here is the super glamorous lady in a pastel pink two-piece. Put your little ones to sleep and get your dancing shoes on with your girl gang and hit the club to celebrate Mother’s Day. This chic and Summery look is definitely trendy and a must-have for this year. This minimalistic attire has been given a neat and polished look with a few pieces of jewels and a pair of black stilettos. If you are a new mom, celebrate this occasion with your bundle of joy. Plan an intimate lunch or dinner with your family and dress up for the occasion. We really like this idea of twinning with your child in matching mommy and me outfits. Mother’s Day is just as much about the kids as it is for the mothers. If you’re a new mom and want a fun way to celebrate the day, throw a themed party where the moms and kids can have fun together. We love this matching Marvel theme outfit that looks very attractive and unique at the same time. Not many people celebrate this day dressing up in fun costumes and so this would be a great new way to do it. You won’t even be required to spend a lot on the look as the outfit comprises of a basic blue dress and a red sweater. The only pieces added to it are a Marvel theme belt and a clutch. This Spring-Summer appropriate dress is exactly what you need to mark this occasion. Take your mother or mother-in-law out on a Sunday brunch for a relaxed time together. This emerald green dress with white sneakers looks sporty and comfortable, something you could wear in the daylight. Put on your glares and throw in a cute bag to finish off this look. Here’s our amazing collection of the Cutest Outfits That You Can Wear with Sneakers. Done with parties and lunches and want something better? Organize a picnic by the lake to have some peaceful time with the family and friends. Whether it is you taking out your mom or planning one with your little ones, this outfit is perfect for the occasion. The figure-hugging dress definitely complements her curves in all the right places and gives a beautifully unique look. The Summer hat seems like a great piece of accessory to help you perfect the outfit and get in the Spirit of the intimate hang out. Here is another “Mommy and Me” look that you could recreate this year with basic pieces of clothing that you can easily find in the store and in your wardrobes. The comfortable and Summery outfit gives a casual yet cool look. You can wear it out to lunch or a day filled with fun activities to help you bond with your little one. The cane bags need separate appreciation as they are currently the hot trending pieces of accessory and are giving us the ultimate Spring/Summer vibes. Don’t miss out the cuteness that is in these 100 Cutest Matching Mother Daughter Outfits on Internet So Far. The Modern Family fame actress, Sofia Vergara, is a paparazzi favorite for her cool style choices. We absolutely adore the bootcut pants that are back in fashion and how. Jeans are a wardrobe staple that can be styled in a number of ways and this bootcut style especially add in a flare to the silhouette. You can wear them with a t-shirt or a formal blouse depending on the occasion. Here is another bootcut style that you can wear with a scarf and a blazer. Your fashion choices should not be defined by age. Defy all norms and pick outfits that complement you and your taste in fashion. How youthful and peppy is this look? A great look that teen girls can sport this mother’s day while taking their family out for fun activities. The animal print belt is a great piece of accessory that can light up any boring outfit. Here are different footwear ideas for you that you can choose to wear this year. Whether you want funky heels or flats, we have some style inspiration for both.